THREE RIVERS, Calif. — Sequoia and Kings Canyon National Parks represent a rich history, that tells the story of a timeless landscape, and the people who helped preserve it. The parks are a part of the vast wilderness of the Sierra Nevada Range in California. 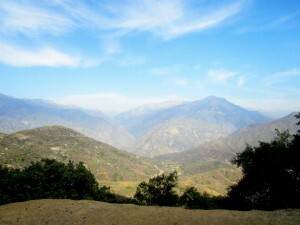 The theme of the region, big trees and big canyons is what inspired the preservation of the two different areas. The landscape testifies to nature’s size, beauty and diversity. Huge mountains, rugged foothills, deep canyons, vast caverns and the world’s largest trees make one of the most unique landscapes in the world. 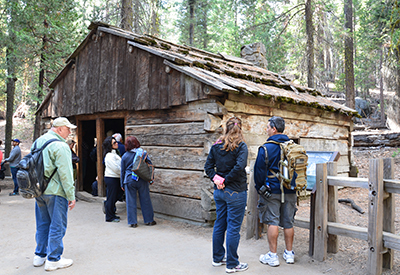 Click on the video at the right to see an audio slideshow about the history and culture of Sequoia-Kings Canyon National Parks prepared by writer Stephanie Meadows. “This pair of side-by-side national parks has been called “The Land of Giants,” and with good reason. The towering mountains, endless canyons and, of course, the world’s largest trees have inspired millions,” said Park Ranger Dawn Ryan. Sequoia National Park, America’s second oldest national park, was established Sept. 25, 1890, just one week before nearby Yosemite National Park was created, to protect the big trees in the Giant Forest. Sequoia is famous for the largest trees in the world and encompasses the country’s longest mountain range, the Sierra Nevada, and its largest mountain called Mt. Whitney. Kings Canyon National Park was established on March 4, 1940. It is located in the Southern Sierra Nevada mountain range, north of Sequoia National Park and south of Yosemite National Park. The Kings River, which drains a portion of the Sierra Nevada Range, gave Kings Canyon National park its name. The scenic beauty of the Sierra Nevada Mountains plays a large part in the history and culture of Sequoia and Kings Canyon National Parks in California (Photo by Stephanie Meadows). Thanks to well-known naturalist John Muir, people began to make an effort to preserve the great trees in the area. He helped put a bill together to save the parks in 1881. Sequoia and King’s Canyon National Park began to be administered by the National Park Service. Even though they were created by separate acts of Congress, Sequoia and Kings Canyon share miles of boundary and are managed as one park. Together, Sequoia and Kings Canyon National Parks total over 863,700 acres. Humans have traveled or lived in the Southern Sierra for at least 6,000 to 7,000 years. In the late 1700s and early 1800s, the Spanish began exploring the edge of the Sierras. Soon afterwards, trappers, sheepherders, miners and loggers poured into the Sierras seeking to exploit whatever the mountains had to offer. Also, by the end of the 19th century, San Joaquin Valley communities looked to the Sierras for water and recreation. “In 1866, the Gamlin brothers built the first hotel and saloon inside the Napoleon tree,” said Park Ranger Frank Helling. The Gamlin brothers cabin in the Giant Forest is preserved for visitors (Staff photo). Today the parks together protect 265 Native American archeological sites and 69 historic sites. There were two main tribes that lived in the area of the parks. In the higher mountains, and also down into the western foothills, lived hunters and gatherers remembered today as the Monache or Western Mono. West of the Monache in the lowest foothills and also across the expanses of the Great Central Valley were a second group, the Yokuts. The tribes were separated by language and history. The Yokuts spoke a Penutian language, like many other tribes of interior California, while the Monache language was similar to the Shoshone or Paiute from the Great Basin east of the Sierra. Most of the Native Americans in the area died in an epidemic in 1862. The largest trees in the world called sequoias grow to about 300 feet in height. Their cinnamon color is due to the presence of tannin in the thick bark and heartwood, which contributes to their resistance to fire, insects, fungus and decay. At the heart of the park, in the shade of towering sequoias and redwood groves, the Giant Forest is home to half of the Earth’s largest and longest-living trees. Named in 1875 by John Muir, the forest is a stand of more than 8,000 colossal sequoia trees, many standing just as Muir found them. The undisputed King of the Forest, the General Sherman tree is not only the largest living tree in the world, but the largest living organism. The tree is 2,100 years old and 275 feet tall. One of the best ways to get to know the Giant Forest and its trees is to visit the Giant Forest Museum. Visitors flock to this part of the park to learn about the history and culture of the parks. They can also learn how to identify trees, discover the difference between California coastal redwoods and giant sequoias and explore the ecology and natural history of the park through interactive exhibits. Like no other place on Earth, Sequoia and Kings Canyon National Parks are alive with mystery and wonder. People think they know what to expect here. They come for the massive trees, but just as often, they leave with something much, much bigger. Plan your visit: Call: 559-565-3341. Sequoia and Kings Canyon National Parks annual pass: $30.